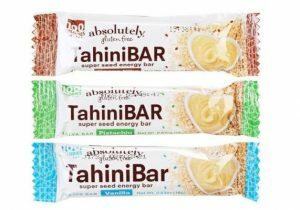 A super seed low calorie energy bar. Dip it into some desserts- if you can wait that long as these are thankfully amazing where you can’t hold onto them! Melt in your mouth low calories healthy snack–these should replace candy bars in a heartbeat! Try Vanilla… no wait, Chocolate! 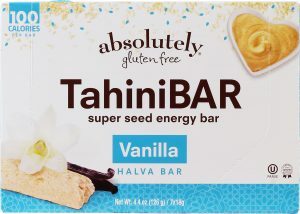 Absolutely Gluten Free, maker of all-natural crackers, flatbreads, and pizza that are both delicious and gluten-free, is taking on the energy bar category with the launch of TahiniBAR, a grab-and-go sesame seed snack that weighs in at only 100 calories. All varieties are certified OU Kosher and dairy-free. Follow them on FB and Twitter @AbsolutelyGF and online at www.absolutelygf.com.